AUGUSTA, Ga. -- On some level, it is absurd to ask an athlete who has not yet seen his 27th birthday why he has failed to win a certain championship. This is especially true in the stationary game of golf, in which the no-contact rules of engagement allow old men to beat opponents half their age. But that question has twisted Rory McIlroy into something resembling a pretzel. This is his eighth Masters, and people cannot understand why he didn't win a single green jacket in his first seven. He was the boy wonder after all, the Tiger Woods fan from across the sea who was going to succeed Woods right here in the U.S. and beyond. Woods' principal benefactor, Nike, bet a lot of money on that proposition and even marketed Tiger and Rory together as an abdicating king and eager prince. And for the most part, McIlroy has honored the shoe giant's faith by winning four major championships by age 25, and three legs of the career Grand Slam. He hasn't won the most important leg, however, a Masters title, which Woods claimed at 21. The Masters is golf's answer to the Super Bowl, and there are more than a few football, baseball and basketball fans who will not tune in for any other golf tournament, the U.S. Open included. So that's why McIlroy is having a hard time figuring out what to say or how to act. Here he is one stroke behind Jordan Spieth at Augusta National entering their dream Saturday pairing, and in one breath, he says this Borg-McEnroe, Magic-Bird, Arnie-and-Jack matchup "would be great for the tournament and create a lot of buzz," and in the next, he retreats from the thought and reads from the tired playbook of the stay-in-the-moment pro. Deep down, McIlroy knows this is a tremendous opportunity for him. Spieth could've run away with a second consecutive Masters, and instead he shot his first score north of par in this tournament in 10 career rounds. His 74 suddenly made this a hell of a ballgame, and one that Spieth's Presidents Cup teammate, Bill Haas, predicted McIlroy would win. Haas played with McIlroy and Martin Kaymer for the first 36 holes and said the Northern Irishman's 1-under 71 in the brutal winds "could've been better. He's giving shots back to be 3-under par. The way he's playing, he's my pick for the weekend. "I haven't gotten to play with him a ton, just a few times. But he's driving it really well, long, and he's swinging as free as I've ever seen him. He always does. He's one of the best ball strikers I've ever seen play. With the conditions the way they are, you got to give the ball striker the advantage, so I like him. I like his chances every week he tees it up, but he really looked strong out there for two days with us." McIlroy desperately wants to turn Haas' prophecy into fact, and he's in an epic fight with himself -- and with human nature -- because of it. He didn't make any pre-Masters trips to Augusta National this spring in an effort to make this big moment small. He ordered himself to relax, to have fun and to basically treat this tournament as if it were a member-guest at the local club. So far, his fresh approach has worked. He said he looked up at a scoreboard during his second round and found himself seven, eight shots behind Spieth, and yet never panicked. McIlroy understood that things change quickly at the Masters, and that he has been on the wrong end of those momentum shifts enough times to know. But the closer McIlroy gets to the green jacket, the more he will press to fill that conspicuous hole in his closet. Only five men have won all four big ones. McIlroy can accomplish something that the likes of Arnold Palmer, Byron Nelson and Sam Snead never did. He can also reestablish his position of power among the Spieths and Jason Days. By winning major No. 5, or two more than Spieth and Day combined, McIlroy can make a case that this newfangled Big Three is really a Big One in disguise. "I'd be lying if I said those guys having success doesn't motivate me. Of course it does," McIlroy said before the tournament. "What Jordan did here last year, and the U.S. Open and the whole way through the summer, and what Jason Day did during the summer and this year as well, yeah, I don't want to be left behind. ... You don't want to see guys beating you. "I want to dominate. I want to go back to the summer of 2014 [when he won back-to-back majors] and play like that for the rest of my career." This weekend at Augusta National would be an ideal time and place to start. If McIlroy takes down Spieth, the defending champ, his mass global appeal could start growing toward a Tiger Woods level. "Rory McIlroy was going to be the guy after Tiger, but now he's got to compete directly against Jordan Spieth to be the most marketable golfer of this new generation," said Steve Rosner, an endorsement and talent representation expert and co-founder of 16W Marketing in New Jersey. "The bottom line is winning. Rory's climbed the ladder with four majors, but the ladder has many stairs. I don't know if we'll ever see another golfer get to Tiger's level, but Rory can continue to grow as a huge international star. He also lives in our country, plays on the PGA Tour and is an adopted American in his persona. So it's possible if he gets his majors into double digits someday, he can be in the U.S. maybe what Peyton Manning has been the last three or four years." That's pretty good company. That's the difference between being a star and a megastar. McIlroy weathered an eight-hole stretch Friday of 4-over golf, drained a long birdie putt at the 16th and made a crazy par save out of the trees on the 18th to earn his Saturday afternoon date with Spieth. 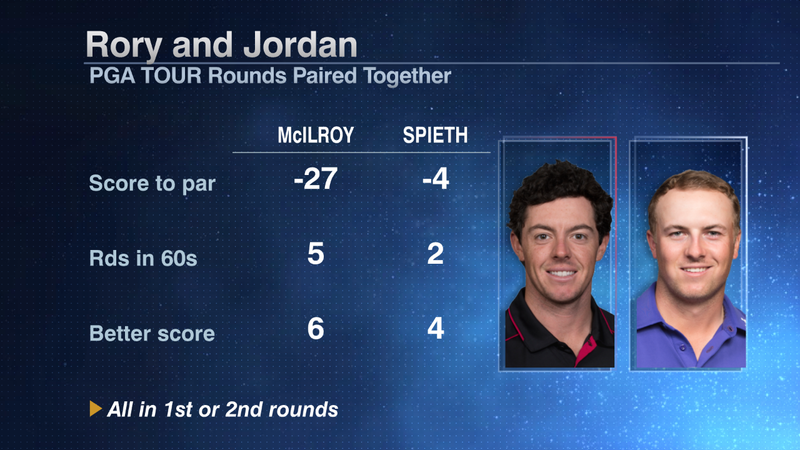 In a dozen previous pairings, McIlroy has shot a combined 27 under, and Spieth a combined 4 under. "I'd rather be playing with someone less threatening, to be honest," Spieth said. McIlroy wasn't always so intimidating. Holding a four-shot lead in the final round here in 2011, McIlroy melted down, shot 80 and wore the weepy body language of a lost pudgy boy. Now a ripped Rory makes Tiger look doughy. But that physique won't help him over the next 36 holes in what promises to be an overwhelming mental struggle. Jack Nicklaus, for one, said it was important for McIlroy to conquer what the six-time Masters winner described as the "stigma" of not winning at Augusta. Toward that end, McIlroy did take a moment Friday to remind himself and the rest of the world that he has blistered Augusta's back nine in the past, and that he has had his share of success against the other contenders in the field. "I'm trying to beat guys on this leaderboard that I've beaten before," he said. "So I need to take confidence from that and know that I've been in this position before." The tough talk didn't last for long, not with McIlroy caught between caution and his desire to crush the final doubts about his game. He said he's doing his damnedest to block out the noise and the magnitude of this event. "It's another golf tournament I'm trying to win," he said. That comment captured the human warfare being waged within. McIlroy has to act as if the thing he wants the most is the thing he wants the least. So this isn't Rory McIlroy against Jordan Spieth as much as it's Rory McIlroy against himself. As always at Augusta, may the best man win.